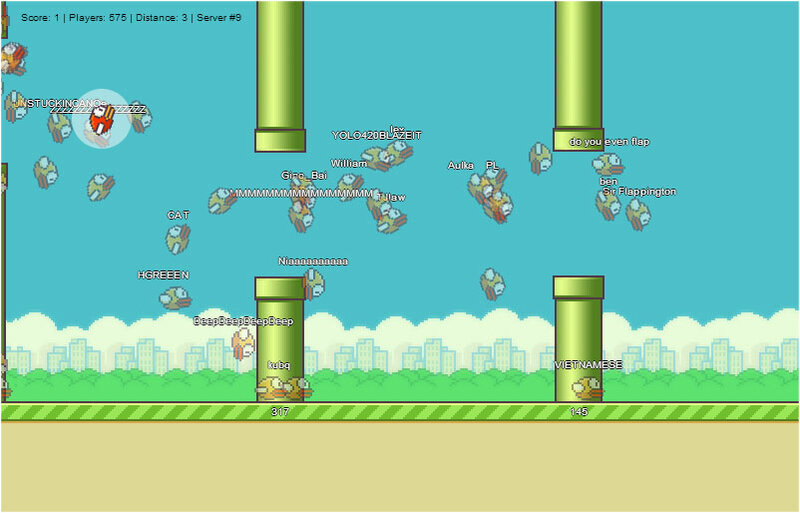 In the wake of mobile game Flappy Bird's popularity came an even funner browser variant called FlapMMO (@FlapMMO). The great thing about FlapMMO is being able to see the attempts of thousands of other players. Even though there's no interaction between the birds, it's still a hilarious competition. It's calling H 60 times per second (likely some kind of frame update), and N every 50 ms. H looks like it instructs all birds to think(), and N looks like its sending an XY coordinate over a websocket. So it seems that the game trusts the client to send the bird's position every 50 ms. The server then relays these coordinates to all other players in the server. There are multiple servers to balance the load, and only players in the same server can see each other. Other players could indeed see this, and I noticed a few other "experimenters" doing similar things like flying in slow motion, backwards, or hovering in place. Unfortunately, the game was taken down by DDoSers that night. By the next morning the developer had implemented a new method of communicating player positions that works very well in improving motion, decreasing traffic, and preventing exploits like this. This lead to another opportunity for some data gathering though, which you can read about here.